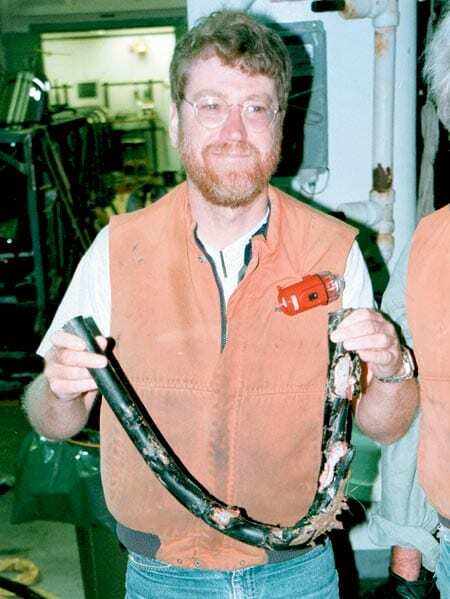 January 2000 — A major obstacle impeding our ability to understand many of the earth’s fundamental, ongoing dynamics—quite frankly—has been a dearth of electrical outlets and phone jacks on the seafloor. On land, scientists have long been able to plug in instruments to take long-term measurements of earthquakes, variations in Earth’s magnetic field, and other episodic or continual geophysical processes. 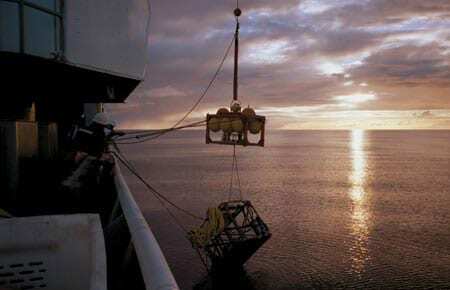 However, deploying instruments in the ocean, and on and below the seafloor, presents unique challenges. First, expeditions to remoteocean regions are more expensive and time-consuming, and they depend on the limited availability of ships. Marine scientists also must contend with corrosion problems peculiar to ocean environments. And without those oceanic outlets and phone jacks, scientists have had limited capacities to supply power to instruments and to store data recorded by them out in the middle of the ocean. 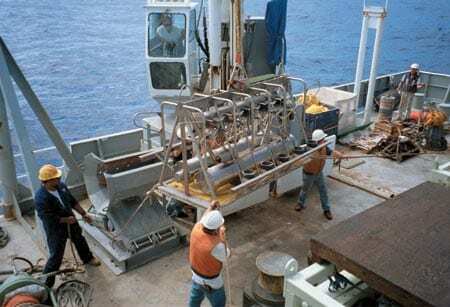 As a result, the record of land-based measurements contrasts starkly with the near-total absence of long-term geophysical data from the seafloor. Since the earth is mostly covered by ocean, that has been like trying to monitor the dynamics of a household, for example, by observing events in only the living room and one bedroom. But in 1998, we seized an opportunity and took a long-sought, significant first step toward opening the relatively unexplored submerged regions of our own planet to more thorough examination. Beneath 5,000 meters of water midway between Hawaii and California, a submarine telephone cable called HAW- 2 (Hawaii-2) stretched across the seafloor. Laid by AT&T in 1964, the cable conveyed trans-Pacific telephone calls until 1989, when it broke near California. Moving toward fiber-optic cable technology, AT&T decided not to fix HAW-2 and donated it to the Incorporated Research Institutions for Seismology (IRIS), a consortium of 91 research centers, for the benefit of the scientific community. 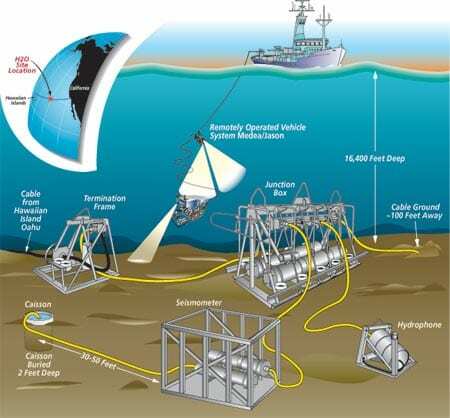 Like a long extension cord, the cable could deliver ongoing electrical power to the seafloor. It could also provide a means for two-way, shore-toseafloor communications to operate instruments remotely and to get data—both in real time. The combination made the retired cable well-suited for a second productive career. In 1995 the National Science Foundation provided funding to develop the technology to take advantage of HAW-2’s potential. Using corrosion-resistant titanium and plastic, we built a junction box to be spliced into one end of the HAW-2 cable. The junction box was designed to provide six simple wetmateable connectors, into which scientists could plug standard instruments with existing deep-submergence vehicles. No longer constrained by low power, limited internal data recorders, and temporary deployments, the instruments for the first time would be able to take continuous measurements of slowly evolving Earth processes in the deep ocean. They could also transmit data on rapidly occurring events, such as earthquakes, in real time. 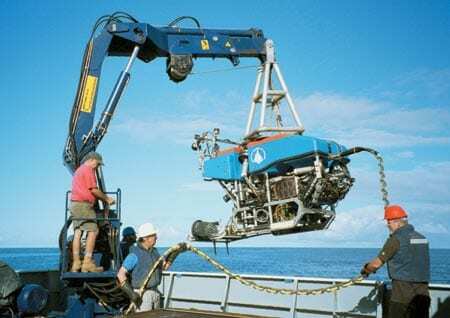 In 1998, the dream of the world’s first long-term, mid-ocean seafloor observatory became a reality, with the establishment of H2O, the Hawaii- 2 Observatory. H2O was also in a scientifically ideal site to place a high-priority instrument: a seismometer to record seismic waves generated by earthquakes. Seismologists analyze these waves to locate and study earthquake sources. And—much the way physicians use ultrasound and CT (computerized tomographic) scans to obtain images of tissue inside human bodies—seismologists can also examine seismic waves traveling through Earth’s layers to glean information about the structure and properties of rocks in ocean crust, and in Earth’s inaccessible mantle, outer core, and inner core. The key to improving all these studies is getting more high-quality measurements from more angles. But the current Global Seismographic Network (GSN) has been entirely land-based. To provide more global coverage, some seismometers have been placed on islands, but these are not generally representative samples of oceanic crust and, more important, vast areas of the oceans are islandless. Located 2,000 kilometers from the nearest land, H2O is the first of 20 sites identified by the seismological community for an Ocean Seismic Network (OSN) that will fill the wide gaps in the GSN. Located at 28°N, 142°W, H2O substantially augments seismic coverage of the eastern Pacific for tomographic studies of the earth. It provides a strategic monitoring point for studies of earthquake sources in the United States’ most earthquakesusceptible regions: California, the Pacific Northwest, Alaska, and Hawaii. With H2O seismic data transmitted via the submarine cable to Hawaii in real time and available immediately via the IRIS Data Management System, seismologists can precisely locate earthquake sources within tens of minutes after a seismic event. H2O also has a deep-water pressure gauge to aid research on tsunamis, large waves generated by earthquakes in the open ocean. Tsunamis caused by earthquakes from the Gulf of Alaska to Central America can be recorded at H2O 30 minutes to two hours before they arrive in the Hawaiian Islands, so H2O eventually may be incorporated into tsunami warning networks. H2O’s enhanced global coverage also offers an advantage for studies of another global phenomenon —geomagnetism. Its power and communications capacities open up new opportunities for creative approaches by physical oceanographers, marine biologists, and other marine scientists. Anticipating that H2O would be a prototype for future seafloor observatories, we aimed to make H2O as simple and cost-effective as possible to use and deploy. An initial requirement was designing a seafloor system that could be installed using a conventional oceanographic ship, rather than a specialized cable ship. In September 1998, aboard the University of Washington’s R/V Thomas Thompson, a survey showed that the proposed site to install H2O was clear of rock outcrops and other topographic complications and well-suited for an observatory. Jason, the remotely operated vehicle (ROV) operated by WHOI’s Deep Submergence Laboratory, was deployed to find the 11/4-inch-wide cable on the seafloor. Jason followed the cable for 5,000 meters (one water depth from ship to seafloor) toward California and severed it using a special hydraulic cable cutter. This was done so that equal lengths of cable would hang from either side of an 800-pound grapnel lowered from the ship to snag and retrieve the cable—just the way you would pick up and balance a strand of spaghetti on a fork tine. Six miles of cable dragged through water put a load on the ship’s wire and winch that approached their working limit of 24,000 pounds, and retrieval took nearly a day. Personnel from WHOI and Margus Inc., a commercial submarine cable company, accomplished the cable recovery. Margus personnel spliced the HAW-2 cable to a corrosion-resistant “termination frame,” which links via a short cable to the junction box. The system was designed to allow the junction box to be lowered separately to the seafloor during installation and to be retrieved for repair or improvements without the complications of dragging up the cable again. The system was powered up from an AT&T cable station in Makaha, Hawaii, and for the first time in nine years, HAW-2 was operational. After several days of testing the system, the termination frame and attached cable were lowered on a trawl wire for deployment on the seafloor—or, at least, that was the plan. The frame was barely over the side when the half-inch chain securing it to the trawl wire snapped, sending cable and frame to the bottom. Expecting the worst, we launched Jason’s mechanical teammate, Medea, to locate and inspect the damage. Tethered to the ship, Medea is a platform that separates Jason from the ship motion, allowing the ROV to maneuver more freely. It also has a wide-area camera and lights. Fortune smiled. The cable was lying in loops 300 meters in diameter, but flat on the seafloor, so that Jason could be used without risk of entanglement. At the edge of the coils, the termination was sitting upright, intact, and not embedded in sediments. After powering up the cable, the system was found to be undamaged—though its planned location had abruptly moved about 2 kilometers closer to Hawaii. Installation of the junction box could proceed. The junction box consists of a protective frame enclosing vulnerable equipment within. The equipment includes a manifold with the eight connectors (one each for the termination frame and a sea ground, and six for scientific instrument packages). The connectors are designed to be plugged in with standard ROV manipulator arms. The frame also encloses two cases designed to withstand deep-sea pressure. One case contains a system developed and built by University of Hawaii engineers to extract and control power from the cable. The other case contains the communication and control system, designed and built by WHOI engineers, that is the heart of the junction box. 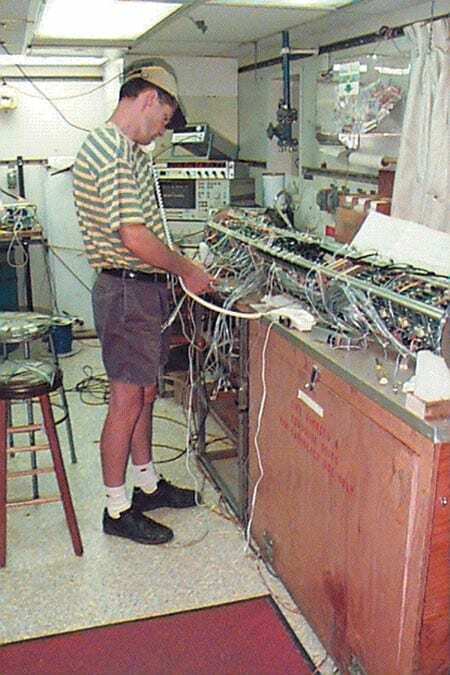 The complex system of switches, modems, and computers allows scientists onshore to monitor and adjust individual instruments. It routes signals into and out of individual instruments, ensuring that data streams do not get muddled even though all signals eventually must travel via a common channel through the submarine cable to and from Hawaii. The system is designed with a great deal of redundancy and switching flexibility to keep it operational without making expensive mid-ocean service calls. The junction box was lowered to the seafloor and Jason plugged the system together. The ability to retrieve the junction box separately came in handy immediately when it failed after just 12 hours. It was unplugged and retrieved by Jason and Medea, repaired aboard Thompson, and redeployed and reconnected two days later. Jason plugged in H2O’s first instrument, a multisensor seismo-acoustic package designed and built at the University of Hawaii. Then the ROV buried the seismometer sensor package in a seafloor hole to minimize distorting vibrations from currents. Data began to flow to Makaha, where communications equipment had been modernized and other equipment (salvaged from another retired trans-Pacific cable system from Guam to Japan) was added to provide a mirror image of the H2O junction box on shore. After H2O had been operating for two months, a water current meter failed and corrupted the seismic data, necessitating a maintenance visit in September 1999. Once again, the system allowed Jason to unplug and retrieve the seismometer system for repair and the junction box for an upgrade without touching the main cable itself. The systems were redeployed and plugged in, as before. Below, scientists used the remotely operated vehicles Jason and Medea to splice an abandoned submarine telephone cable into a termination frame, which acts as an undersea phone jack. Attached by an umbilical is a junction box, which serves as an electrical outlet for up to six scientific instruments. Thomas Thompson crew members prepare to submerge H2O's first "customer," a package of instruments to record earthquake-generated seismic waves.